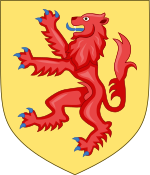 The name Holland first appeared in sources for the region around Haarlem, and by 1064 was being used as the name of the entire county. By the early twelfth century, the inhabitants of Holland were called Hollandi in a Latin text. Holland is derived from the Old Dutch term holtlant ("wood-land"). This spelling variation remained in use until around the 14th century, at which time the name stabilised as Holland (alternative spellings at the time were Hollant and Hollandt). A popular but erroneous folk etymology holds that Holland is derived from hol land ("hollow land" in Dutch) purportedly inspired by the low-lying geography of the land. "Holland" is informally used in English and other languages, including sometimes the Dutch language itself, to mean the whole of the modern country of the Netherlands. This example of pars pro toto or synecdoche is similar to the tendency to refer to the United Kingdom as "England", and developed due to Holland's becoming the dominant province and thus having the majority of political and economic interactions with other countries. The people of Holland are referred to as "Hollanders" in both Dutch and English, though in English this is now unusual and nearly-archaic. Today this refers specifically to people from the current provinces of North Holland and South Holland. Strictly speaking, the term "Hollanders" does not refer to people from the other provinces in the Netherlands, but colloquially "Hollanders" is sometimes used in this wider sense. In Flanders it is quite common to speak of "Hollanders" when speaking of people from the Netherlands. In the Dutch Rebellion against the Habsburgs during the Eighty Years' War, the naval forces of the rebels, the Watergeuzen, established their first permanent base in 1572 in the town of Brill. In this way, Holland, now a sovereign state in a larger Dutch confederation, became the centre of the rebellion. It became the cultural, political and economic centre of the United Provinces (Dutch: Verenigde Provinciën), in the 17th century, the Dutch Golden Age, the wealthiest nation in the world. After the King of Spain was deposed as the count of Holland, the executive and legislative power rested with the States of Holland, which was led by a political figure who held the office of Grand Pensionary. From 1806 to 1810 Napoleon styled his vassal state, governed by his brother Louis Napoleon and shortly by the son of Louis, Napoleon Louis Bonaparte, as the "Kingdom of Holland". This kingdom encompassed much of what would become the modern Netherlands. The name reflects how natural at the time it had become to equate Holland with the non-Belgian Netherlands as a whole. 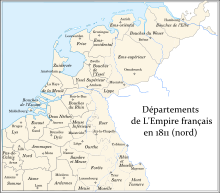 During the period when the Low Countries were annexed by the French Empire and actually incorporated into France (from 1810 to 1813), Holland was divided into départements Zuyderzée, and Bouches-de-la-Meuse. From 1811 to 1813 Charles-François Lebrun, duc de Plaisance served as governor-general. He was assisted by Antoine de Celles, Goswin de Stassart and François Jean-Baptiste d'Alphonse. After 1813, Holland was restored as a province of the United Kingdom of the Netherlands. 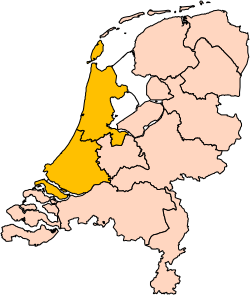 Holland was divided into the present provinces North Holland and South Holland in 1840, after the Belgian Revolution of 1830. This reflected a historical division of Holland along the IJ into a Southern Quarter (Zuiderkwartier) and a Northern Quarter (Noorderkwartier), but the present division is different from the old division. From 1850, a strong process of nation formation took place, the Netherlands being culturally unified and economically integrated by a modernisation process, with the cities of Holland as its centre. Holland is protected from the sea by a long line of coastal dunes. The highest point in Holland (about 55 metres (180 ft) above sea level) is in the Schoorlse Duinen [nl] (Schoorl Dunes). Most of the land area behind the dunes consists of polder landscape lying well below sea level. 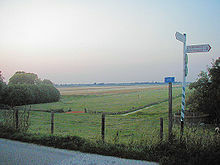 At present the lowest point in Holland is a polder near Rotterdam, which is about seven metres (23 ft) below sea level. Continuous drainage is necessary to keep Holland from flooding. In earlier centuries windmills were used for this task. The landscape was (and in places still is) dotted with windmills, which have become a symbol of Holland. Holland is 7,494 square kilometres (2,893 square miles) (land and water included), making it roughly 13% of the area of the Netherlands. Looking at land alone, it is 5,488 square kilometres (2,119 square miles) in area. The combined population is 6.1 million. The stereotypical image of Holland is an artificial amalgam of tulips, windmills, clogs, cheese and traditional dress (klederdracht), but this is far from the reality of everyday Holland. This can at least in part be explained by the active exploitation of these stereotypes in promotions of Holland and the Netherlands. In fact only in a few of the more traditional villages, such as Volendam and locations in the Zaan area, are the different costumes with wooden shoes still worn by some inhabitants. The predominance of Holland in the Netherlands has resulted in regionalism on the part of the other provinces, a reaction to the perceived threat that Holland poses to their local culture and identity. The other provinces have a strong, and often negative, image of Holland and the Hollanders, to whom certain qualities are ascribed within a mental geography, a conceptual mapping of spaces and their inhabitants. On the other hand, some Hollanders take Holland's cultural dominance for granted and treat the concepts of "Holland" and "the Netherlands" as coinciding. Consequently, they see themselves not primarily as Hollanders, but simply as Dutch (Nederlanders). This phenomenon has been called "hollandocentrism". The predominant language spoken in Holland is Dutch. Hollanders sometimes call the Dutch language "Hollands," instead of the standard term Nederlands. Inhabitants of Belgium and other provinces of the Netherlands use "Hollands" to mean a Hollandic dialect or strong accent. Standard Dutch was historically largely based on the dialect of the County of Holland, incorporating many traits derived from the dialects of the previously more powerful Duchy of Brabant and County of Flanders. Strong dialectal variation still exists throughout the Low Countries. Today, Holland proper is the region where the original dialects are least spoken, in many areas having been completely replaced by standard Dutch, and the Randstad has the largest influence on the developments of the standard language—with the exception of the Dutch spoken in Belgium. Despite this correspondence between standard Dutch and the Dutch spoken in the Randstad, there are local variations within Holland itself that differ from standard Dutch. The main cities each have their own modern urban dialect, that can be considered a sociolect. Some people, especially in the area north of Amsterdam, still speak the original dialect of the county, Hollandic. This dialect is present in the north: Volendam and Marken and the area around there, West Friesland and the Zaanstreek; and in a southeastern fringe bordering the provinces of North Brabant and Utrecht. In the south on the island of Goeree-Overflakkee, Zealandic is spoken. ^ a b c d "Holland or the Netherlands?". Dutch Embassy in Sweden. Archived from the original on 27 October 2016. Retrieved 15 December 2012. ^ a b Oxford English Dictionary, "Holland, n. 1," etymology. ^ George Mikes, How to be an Alien, "When people say England, they sometimes mean Great Britain, sometimes the United Kingdom, sometimes the British Isles - but never England." ^ "Is "Holland" the Same Place as "the Netherlands"?". ^ C.F. Gijsberti Hodenpijl (1904) Napoleon in Holland, pp. 6-7. ^ "Highpoints of the Netherlands". Archived from the original on 20 September 2015. This page is based on the Wikipedia article Holland; it is used under the Creative Commons Attribution-ShareAlike 3.0 Unported License (CC-BY-SA). You may redistribute it, verbatim or modified, providing that you comply with the terms of the CC-BY-SA.